The first issue of Snappy Stories was published in August 1912 under the direction of William C. Clayton. The magazine ran for a total of 321 issues, featuring roughly 128 pages of mildly provocative stories, serialized novels, bawdy jokes, racy pen and ink drawings, and letters from readers. Edited by Virginia O’Day, and later Alexander Samalman, issues sold for 15 cents through 1919, then for 20 cents through 1925, at which time the cover price rose to 25 cents. 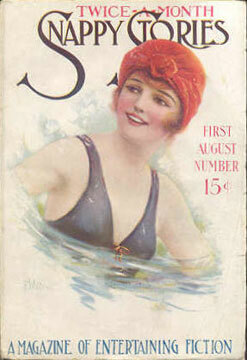 Snappy Stories was marketed as ‘A Magazine of Entertaining Fiction,’ echoing the subtitle of Street & Smith’s Ainslee’s Magazine: ‘A Magazine of Clever Fiction.’ For its masthead, Clayton had borrowed the familiar large, swirling S’s from the cover of The Smart Set, where Clayton had formerly been employed. The magazine’s use of pen names makes it difficult to identify individual authors, but it is likely that Clayton’s new publishing venture initially made use of the Smart Set’s contributors lists, as well as previously rejected Smart Set manuscripts. One of the original examples of the ‘girlie pulps,’ Snappy Stories attracted attention on the newsstands with its raucously flirtatious covers, featuring the work of pin-up artists like Enoch Bolles. The magazine’s popularity spawned a slew of copycat publications, notably Parisienne Monthly and Breezy Stories in 1915 and Pep and Saucy Stories in 1916. Reflective of the shifting social and cultural paradigms of the inter-war years, Snappy Stories would manage to maintain a promise of suggestiveness, while avoiding censorship. The stories often juxtapose the dynamics of modernity against strict moral standards, satirizing religious, patriotic, and sexual Puritanism. The institution of marriage and the culture of high society were often targets of derision. Commonly recurring cultural tropes of the Flapper and the Chorus Girl articulated the New Woman as a subject of both admiration and ridicule. In September 1915, Snappy Stories became a bi-monthly publication. 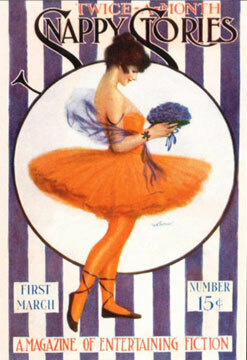 By 1924, it had a combined circulation, along with Street & Smith’s Live Stories, of over 400,000. 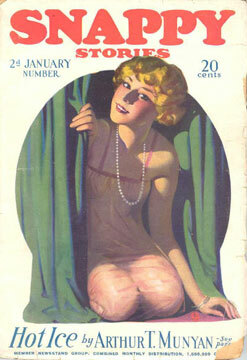 In December 1926, however, the magazine fell into irregular publication and was re-titled Snappy Stories and Pictures. In 1930, it was sold to Lowell Publications, and in 1933 sold again to BT Publishing. The title ended shortly thereafter. Earle, David M. Re-Covering Modernism: Pulps, Paperbacks, and the Prejudice of Form. Surrey, England: Ashgate, 2009. Mullen, R.D. “Standard Magazines to Pulps and Big Slicks: A Note on the History of US General and Fiction Magazines”. Appendix. Science Fiction Studies. 65.22 (1995).